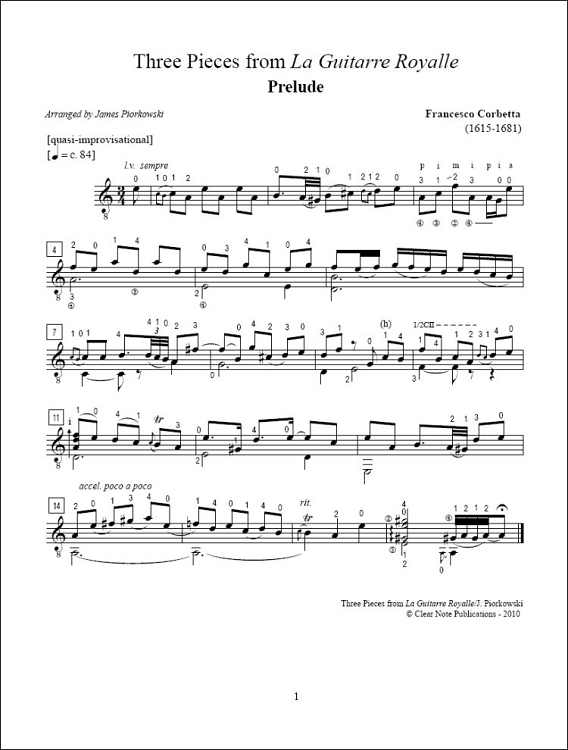 These three movements are selected from Francesco Corbetta's La Guitarre Royalle (1671). The Prelude and Allemande are from his Suite in A Minor, while the Caprice de Chaconne is from his C Major Suite. I chose these movements simply out of my fondness for them, and when performed as a set, they complement each other well. 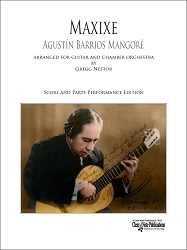 While creating these arrangements from compositions written for the 17th century five-course guitar, I utilized the idiomatic techniques and approaches of the modern sixstring guitar when beneficial to the music. When adding embellishments (passaggi, trilli, accenti) and devising textural treatments (campanella) in these works, my objective was to be stylistically appropriate, while enhancing the composer’s intent. 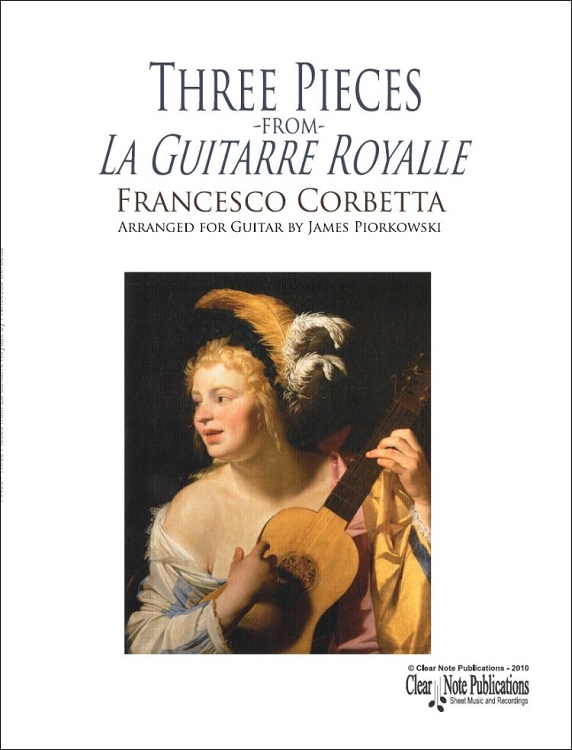 Corbetta’s compositions in this volume are more mature and developed both in harmony and form, when compared to his earlier published works from 1639, 1643, and 1648. In this 1671 collection, occasionally, one will find strong dissonances and unexpected harmonies in the tablature notation. Personally, these "zesty seasonings" make this music all the more appealing. Prelude - preludes from this period were sometimes performed as spontaneous improvisations, and were used to establish tonality while testing the tuning of the instrument by playing key - centered harmonies and scales. This prelude was composed in a way that embodies that character, so the performer should play with appropriate rubato and flexibility. Allemande – in typical 17th century fashion, this allemande utilizes an anacrusis to begin each phrase, with subsequent cadences occurring on downbeats. In repeating the A and B sections, I have included my own thorough-composed embellishments, which commonly would have been improvised by a baroque period guitarist. Caprice de Chaconne - begins on the second beat of the measure, which establishes the pattern for all phrases resulting in metrically accented cadences, with subsequent phrases beginning on beat two. When it seemed suitable to the form of this composition, I added ornamented repetitions to certain phrases, which was not indicated in the original tablature. Also, please note the frequent use of hemiola* in the two measures leading up to cadences. In mm. 48-55, these florid passages can be interpreted with some rubato, (but not too much! ), to create an extemporaneous – sounding cadenza. * hemiola- in baroque dance music, a hemiola denotes the beat groupings and articulation (through shifted accents) of two measures of triple meter to sound as if they were three measures of duple meter.